How does the Australian economy look for 2017? Most indicators point to an unremarkable year. Deborah Zimmer on making the move to Australia, travelling the world and working for the next generation cloud provider. In 2016 we saw a rush to new technologies in the Big Four. This year will be all about how they bring it into their workflow. 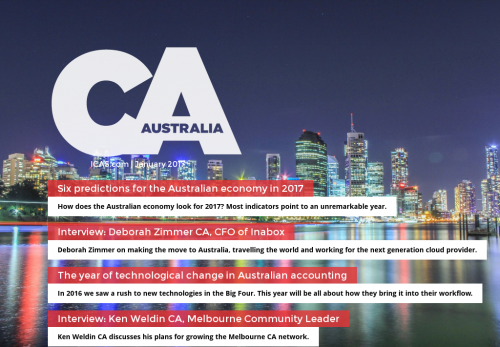 Ken Weldin CA discusses his plans for growing the Melbourne CA network.